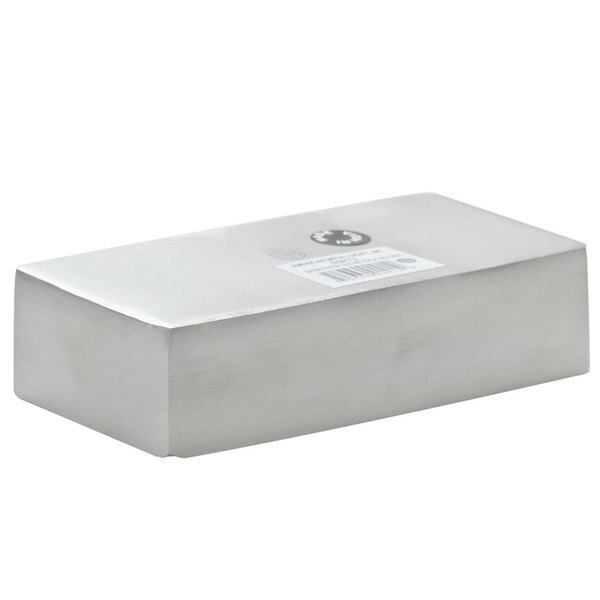 Store sugar and sweetener packets, coffee stirrers, and creamers in style with this American Metalcraft SSPT3 4 1/4" x 2 1/4" rectangular satin finish stainless steel sugar packet / cube holder. Featuring a timeless satin finish and durable stainless steel design, this sugar packet / cube holder is a surefire way to spruce up your tabletops while camouflaging everyday wear and tear. Alternatively, use it to organize smaller caddies on your table or at your checkout or host stations, or to hold buttermints for guests to grab "on the go". 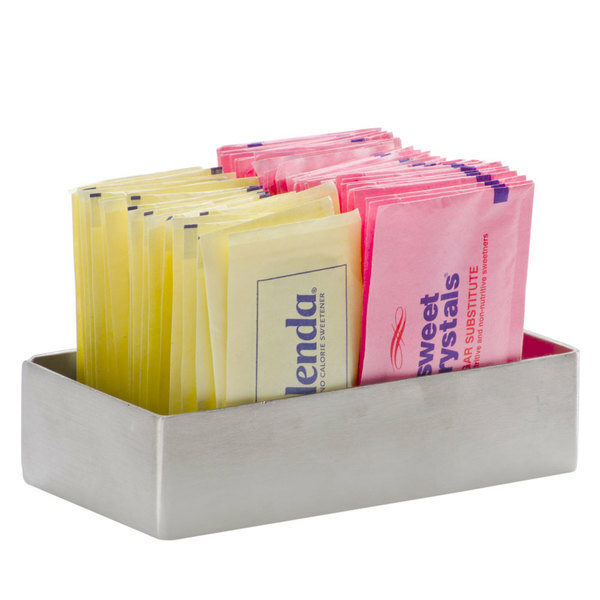 With this sugar packet / cube holder, you'll be able to store pink, yellow, and blue sweeteners alongside sugar and creamer packets. Use it to hold sugar sticks or cubes, too. Take it to the office to store paperclips and binder clips, or use it to serve sauces and even small sides. 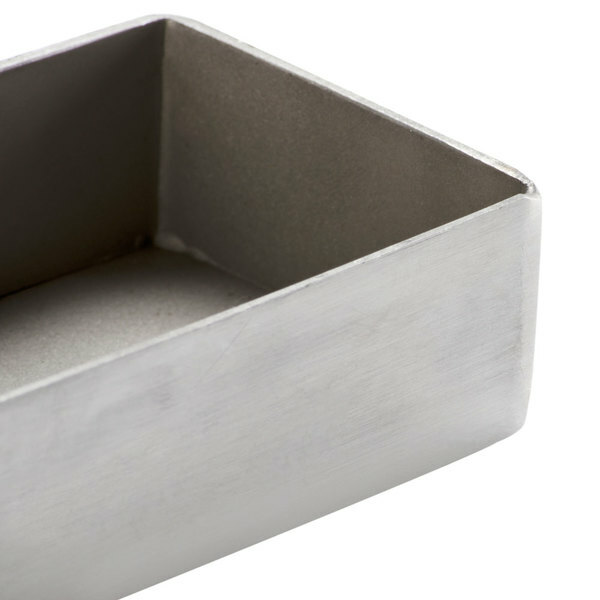 Bring out your restaurant or cafe's personality with this satin finish stainless steel rectangular sugar packet / cube holder. 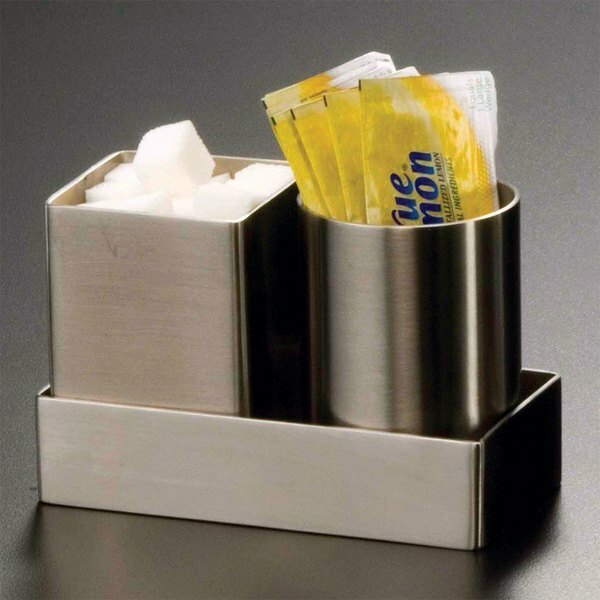 For a unique, one-of-a-kind setup, consider mixing this sugar packet / cube holder with other American Metalcraft satin finish stainless steel sugar packet / cube holders (each sold separately). By setting one SSPH2 and one SSPT5 side-by-side within the SSPT3, you can double your sugar offerings while maintaining a single footprint on the table. This sugar packet / cube holder works well in most modern settings. 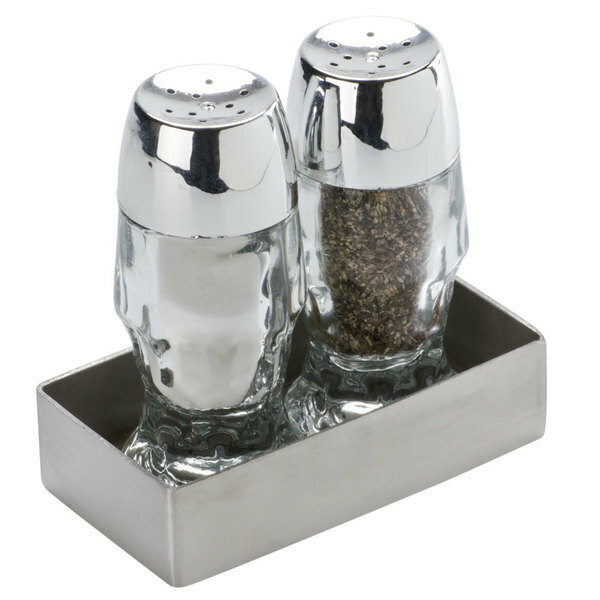 Plus, since it's made of stainless steel, it looks great in classic applications, too! Use it alongside coffee, tea, iced tea, and more. 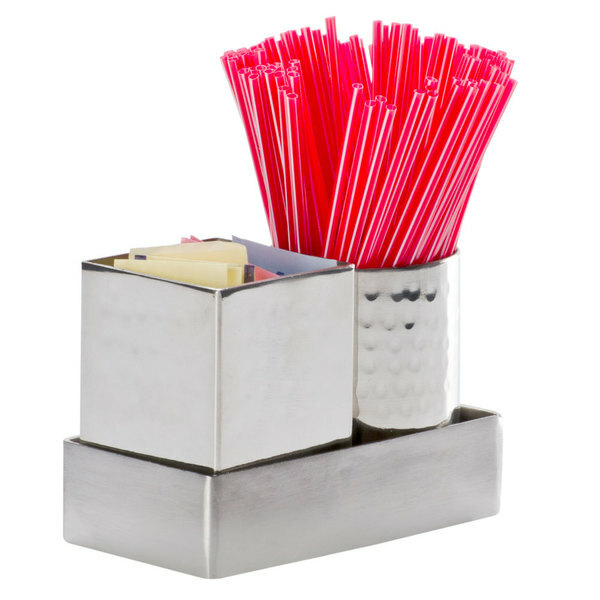 Where ever added sugar or sweeteners are desired, this sugar packet / cube holder is sure to hold them in style. 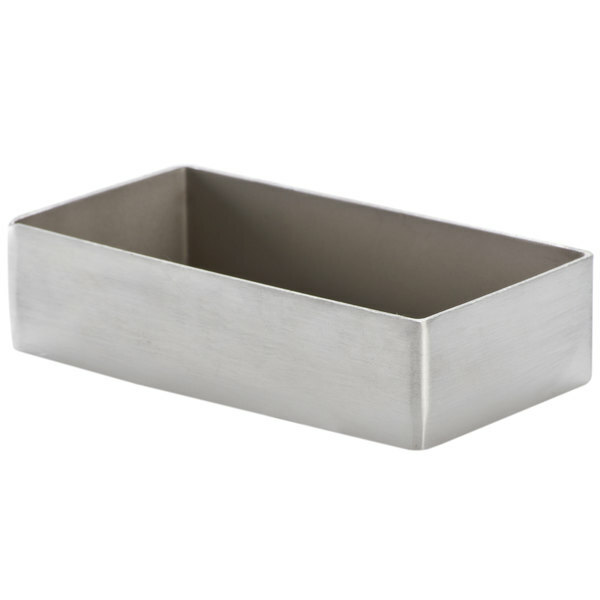 American Metalcraft SSPH4 Rectangular Sugar Caddy Stainless Steel 3 1/4" x 2 3/4"
American Metalcraft RTSSPH3 Rectangular Angled Satin Stainless Steel Sugar Caddy - 3 1/8" x 2 1/2"
This stainless steel rectangular sugar caddy is very good for holding anything, not just sugar. It's washable and very durable, dropped several times and it still looks great! This stainless steel rectangular sugar caddy comes in two finishes, I got the standard finish. It's great for a smaller offering of sugars, for cafe tables, or, for entertaining at home. Fits about 40 or so packets. Has a nice weight to it, so it won't tip over. I bought two of them, and the finishing on some of the edges is a bit rough, so won't want to glide your finger across the edges, as some of them remain sharp.